Former WHEN meteorologist, Todd Glickman, has been kind enough to provide some of the station's promotion pieces he acquired while serving as one of WHEN's popular weather forecasters, along with Joe Zona, Ken McKinley and Gary Best. Below is a flyer used by the station to promote its crack news team. Notice too that all the guys wearing ties. No slouches here. 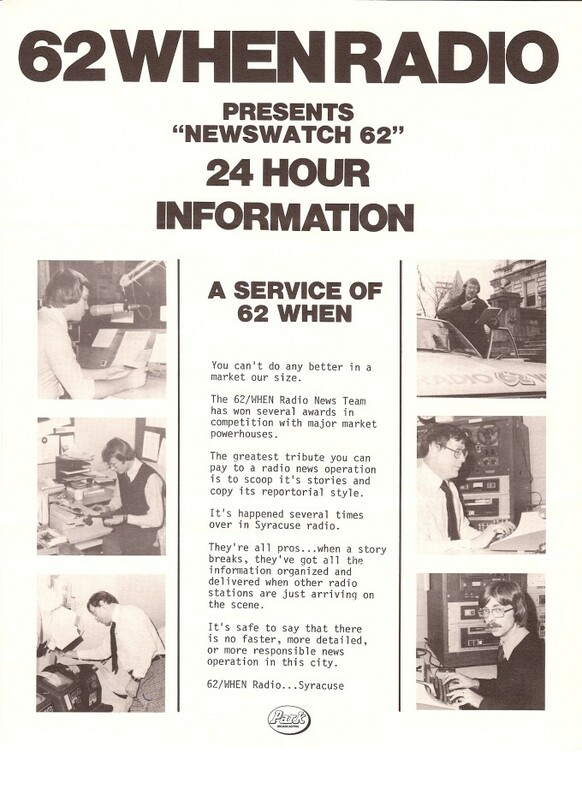 The Newswatch 62 promotional piece was done in the late 70s (circa 1978) and was part of a promotional package often sent to out-of-town agencies and prospective advertisers. Photo ID - Top to bottom (left side): Jeff Scheidecker, Dave Bristow, Jules Coleman. Top to bottom (right side) Dave Bristow, Jules Coleman and News Director, Bill Carey - Thanks Todd!